as much as you would like to? 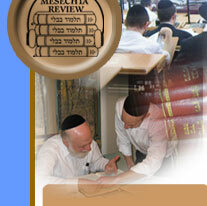 Daf Yomi Mesechta Review shiurim have been used by thousands of Daf Yomi learners, as well as hundreds of Maggidei Shiur, Rabbonim and Roshei Yeshiva around the world. The project was encouraged and endorsed by Gedolei Yisroel including Harav Avrohom Pam, zt”l and Harav Mordechai Gifter, zt”l.